Poor air quality is a problem all over the world. Polluted air is linked to a variety of health concerns, ranging from short-term irritation to serious diseases or even death. Much of the pollution that's affecting our air comes from human activities. It is a result of manufacturing, transportation and a dependence on fossil fuels like gas and coal. Exposure to pollutants like smog, sulfates, nitrates and carbon can have a significant impact on both human health and the health of the earth. According to the World Health Organization (WHO), pollutants like nitrous oxide and sulfer dioxide cause inflamed airways, eye irritation and damage to the respiratory tract. An irritated respiratory tract can induce coughing, mucus secretion and long-term infections. It is particularly damaging to those with asthma or compromised immune systems. 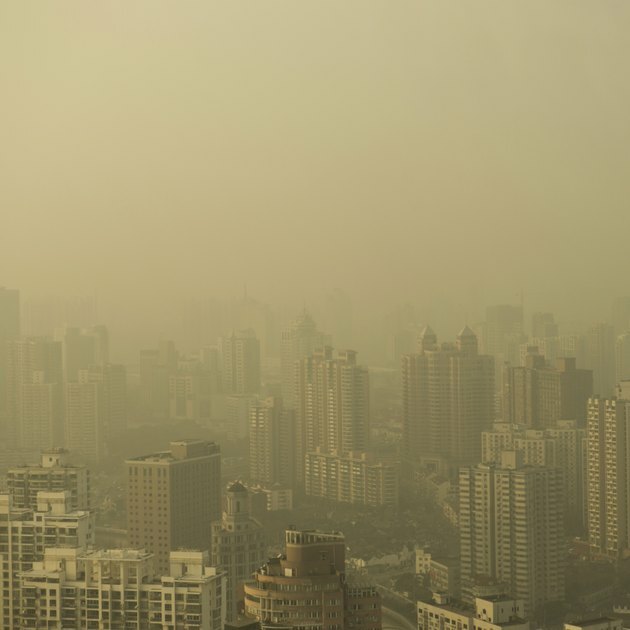 Over time, exposure to poor air quality can lead to reduced lung function and breathing problems as well as lung cancer or cardiovascular disease. Those with pre-existing cardiovascular or lung diseases are particularly vulnerable to the effects of pollution, and may find their conditions worsened due to exposure. Air pollution has a staggering impact on life expectancy and mortality rates. According to the WHO, more than two million people die prematurely each year due to the effects of poor air quality. Even in relatively "clean" areas, life expectancies are shortened by 8.6 months on average due to pollution from human activities. Mortality rates increase by 0.3 percent each day for every 10 micrograms per cubic meter increase in pollution or smog within a region. The WHO estimates that cities with relatively high levels of pollution have a 15 to 20 percent higher rate of mortality than cities with relatively low levels of pollution. According to the U.S. Environmental Protection Agency, air quality inside the home is often two to five times worse than it is outdoors. After certain activities, like painting or floor removal, the air in your home can be up to 1,000 times worse than the air outside. This is due to off-gassing of volatile organic compounds (VOCs) found in paint, adhesives and many everyday objects in the home. Exposure to poor indoor air quality can cause short-term eye, nose and throat irritation as well as headaches, dizziness and fatigue. It can also exacerbate the effects of asthma, particularly in children. Over time, this exposure can lead to respiratory disease, cardiovascular disease or even cancer. Is Turpentine Healthy for the Lungs? How Do Factories Pollute the Air? Is Your Home in an Air Pollution Danger Zone?